By Nels Dzyre in Culture. Updated on February 21, 2019 . 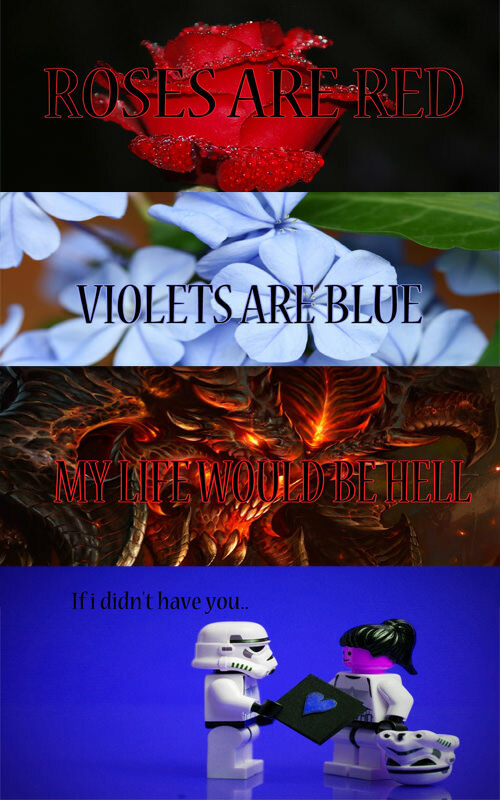 Some of you may look forward to Feb 14 as a day to celebrate your love, while others treat it like any other Thursday. Technically Valentine’s Day isn’t restricted to a celebration between two people who are dating, or in a relationship. Valentine’s Day can be celebrated with good friends, family members, or just about anyone who is lucky enough to be loved by you. And this is even more so with the start of new relationships. If you are hoping to declare your love for someone, surprise them by asking them to go steady with you, or just to remind them that they are always on your mind, we have 5 creative ideas you can try this Valentine’s Day. Declaring your love for someone face to face may be easy for some of you but if you really want to make it special and announce it to the world, we have a way that can make everyone take notice. Rather than just share one declaration on one page, why not share it via your social network covers? You can do it with Facebook Covers: Be My Valentine, [angel’s name]! 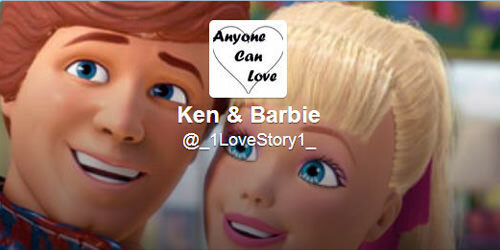 Or juice up your Twitter header to reflect your love story like Ken & Barbie did here. Try this idea out with other social networks that you and your better half are on. 2. What Will Our Baby Look Like? Warning: this may freak some of you out, so try this at your own risk! If you and your partner have played with the idea of having kids, this may be a fun thing to do. 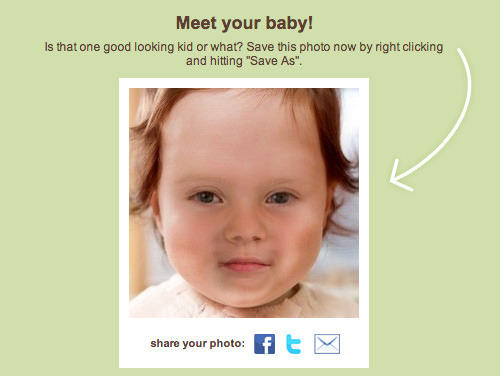 Grab two photos, one of you and one of your partner and drop by thebump.com to see what your future kid may look like. Upload both photos into the app. Choose the gender of your baby or click ‘Surprise Me’. Choose your kid’s skin tone, or click ‘Surprise Me’. 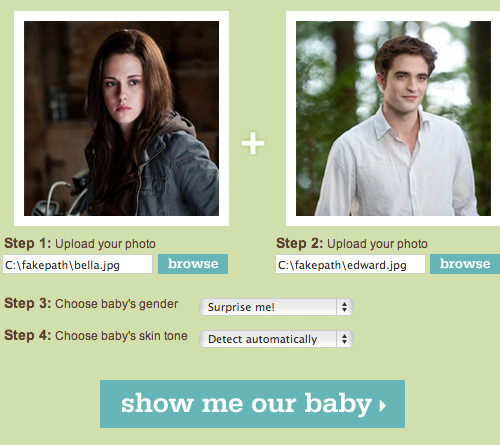 Finally, click the ‘Show me our baby’ button at the bottom. Results may vary. 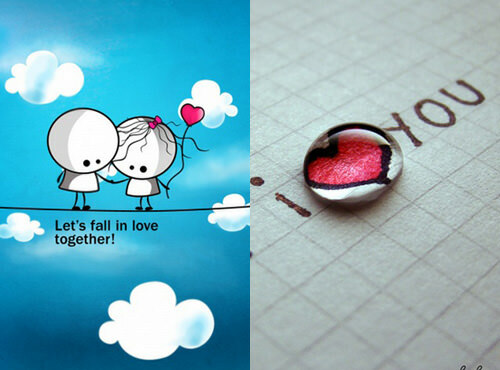 Share the photos to your partner by sending it to her Facebook, Twitter or Email. 3. 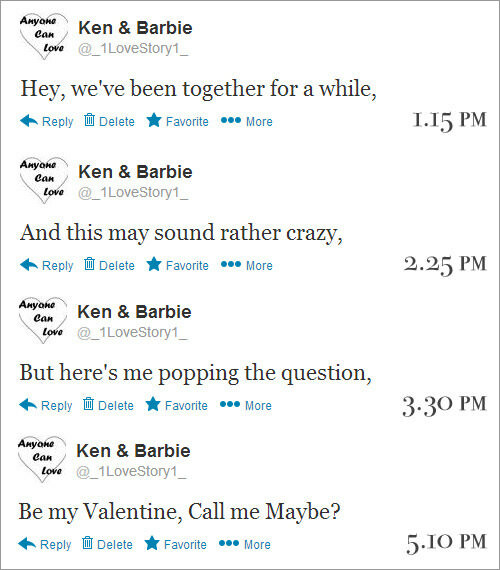 It’s A Love Poem, Baby Just Say Yes. If it is too late for you to setup something elaborate like a dinner with a string quartet, or a home-cooked candle-lit meal, then let’s take to social media to save the day. This is a bit tricky, but I think it is worth the effort: Schedule a string of love ‘lines’ to your other half but put it on all of your social networks. If you want to up it even more, schedule them so that the storyline can be followed. Hey, we’ve been together for a while, And this may sound rather crazy, But here’s me popping the question, Be my Valentine, Call me Maybe? 2. Next, schedule line after line of your poem to your social networks. We are going to try this out with Twitter. We’re guessing if things are getting serious, you can at least get into their phone or tablet, right? Why not change their lock screen view to surprise them? You can put a love note there, a picture of you, or a ring? Okay, maybe that’s a bit of a rush, but you get the idea. You know what? If your partner has an Android phone and if you have the skills and time for it, you can even customize their home screen for a completely, one-in-a-million look. QR Codes are touted as a great marketing tool to connect offline customers to online materials. But it’s also a great tool to hide, then execute the surprise you’ve planned. 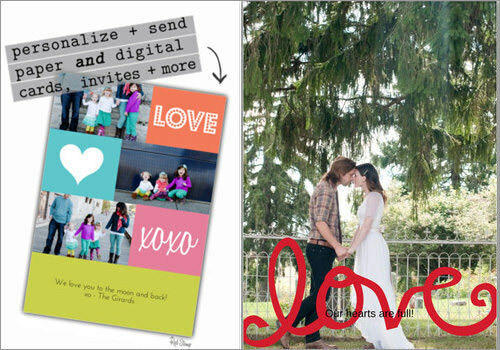 Your Valentine’s Day plans can be turned into a treasure hunt with proper use of QR Codes. 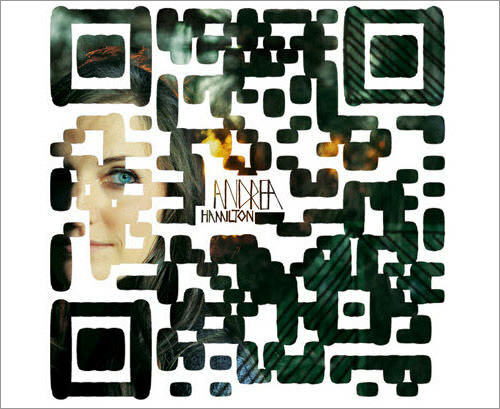 Nowadays you can use QR Codes to link to a Youtube Video (created just for her), a location on Google Maps (where a romantic dinner will be), to a phone number you can immediately call or to a website URL or Facebook page (See Idea #1). Even better, now you can put designs on QR Codes, change it to a color that is not black and white, or print it on a cup or a T-shirt with services like qrstuff.com. Personalize the bejeesus out of that Code and gift it to her on Valentine’s Day for her to claim her surprise. You have a certain photo that you wish to send to someone on Valentine’s? Why not turn it into a unique stamp card. They have collections of templates for you to choose from. And you can even set a prize for every tenth stamp they get. 2. Surprise Him/Her with rotating wallpapers. An extension of Idea #3, play instead with the wallpapers on her computer. Manage a set of photos or wallpapers of your choice and put your favorite lines and inscriptions in. Then set them in slideshow mode. If your partner is the kind who cannot live without his music, you can hide your messages in their playlist. 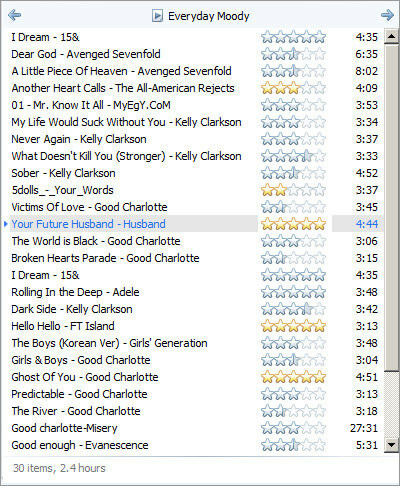 If you are up for it, you can arrange the song titles to spell out a message, or just hide a completely unexpected message in one of the song titles.